The Killers are an American alternative rock band from Las Vegas, Nevada, formed in 2002. The band consists of Brandon Flowers (vocals, keyboards), Dave Keuning (guitar, vocals), Mark Stoermer (bass guitar, vocals) and Ronnie Vannucci Jr. (percussion, drums). Part of the post-punk revival movement, The Killers draw their influences from music styles of the 1980s. The group's debut album, Hot Fuss (2004) brought the band mainstream success. The Killers' second album, Sam's Town, was released in 2006, and the compilation album Sawdust containing B-sides, rarities, and new material, was released in 2007. 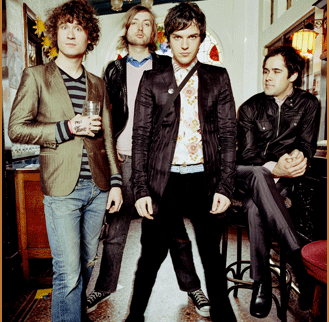 Their third studio album, Day & Age, produced by Stuart Price, was released in November 2008. I use to hate these guys, But for 6 months or so I have adored them. There music is just great. Weather it is 'Somebody Told Me' or 'Spaceman' it is all great. Any other fans? Crap. Absolute crap. Never liked a single song by these guys. Up there on my hate list with the "riff stealing bastards" Jet.